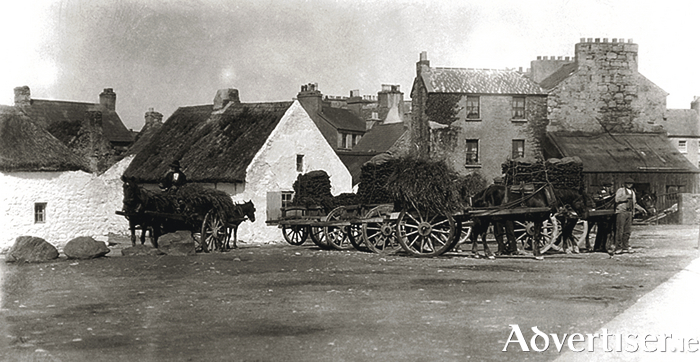 This photograph of the turf market at the Claddagh, near Wolfe Tone Bridge, was taken by the journalist Lillian Bland in 1908. This market used to take place regularly as farmers, mostly from the Barna/Furbo area, sometimes even Spiddal, would bring their cartloads of beautifully stacked turf to town. They were hoping to barter or sell their produce and then do their shopping in town. They often carried loads of hay, sometimes loose, sometimes tied, and large cans of milk, also for sale. There was a weighbridge on the other side of the cottages in our photograph which was often used in these transactions. The thatched cottages are at the end of Garra Glas (green field or green garden ) in the Claddagh and would be roughly where the fire station is today. The sloping roof we see on the right of picture was John Beatty’s forge. The folklore is that the Beatty family once had a foundry in Mill Street. John Beatty was a prominent athlete and sportsman — handball, greyhounds, and rowing were his sports. He was a smithy and ironworker who made heavy implements like anchors, and was well known for the near perfection of his oyster dredges. His last job by his own hands was the gate for the Lourdes Grotto at the Dominican Church. His wife designed the grotto at Henry Street. There was a big boulder in front of the forge where local children used to play when John was not shaping iron on it. This forge later became Mitchell’s Claddagh Service Station. The gable end we see behind the forge was of Cahill’s pub, later Keane’s and later still Haverty’s, which faced Raven Terrace. Johnny Connolly’s pub (later Maguire’s ) was next door, then Hanny Gannon’s sweet shop and at the end was Coyne’s pub, --- three pubs and a sweet shop on one terrace. The official name for the little street is Burke Terrace named after Fr Tom Burke. How it became Raven Terrace, I don’t know, though we should know the facts and the myths of place names around us. Can anybody help? The three-storey building facing the camera, next to Cahill’s, belonged to Martin Hanley, later to Mr Glennon and later to George Gay who had a furniture store there. There was a small garden and wall in front of it. Next door was Ned Finneran’s forge. Ned was a farrier who went blind in later life. His nephew, Tom Madden, worked with him. This building later became Michael Murphy’s butcher shop. Next to that was Miss Shields’ School. Mrs Burke, Miss Browne, and Miss McDonagh taught there. A small tidal stream ran from right to left roughly on the far side of the cottages when there was a very high tide in the Quay Stream. It flowed along Grogan’s Lane, then through a field known as ‘The Flaggers’ (where Fr Griffin Road is now ) before it disappeared in waste ground known as ‘The Boggers’, roughly where Whitestrand is today.